The Cordillera Blanca is open almost all year, however, the best season to visit the Huascaran National Park, is from April to October, the Andean summer. During these months the weather and climate are favorable for all kind of activities. Peru’s official language is Spanish, although a significant number of Peruvians speak Quechua and Aymara in the Andes, and other native languages in the Jungle. However in Huaraz the main city near to the Cordillera Blanca, the travel agencies or tour operators have staff who speaks English or other languages. The official currency of Peru is the Nuevo Sol (S/. ), also the US Dollar is accepted in most local business, restaurants at the day’s exchange rate. In Huaraz you can exchange foreign currency (USD and Euros) at the banks and Casa de cambios (for English: Money Exchange houses). 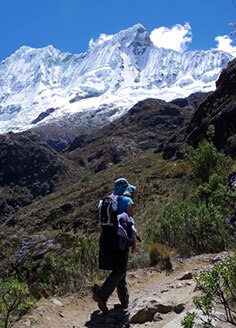 The Cordillera Blanca area is particularly safe, in the main trekking circuits and mount climbing access trails there are park ranger offices. When you are camping in the mountain range don’t leave your personal items outside your tents . Telephone: (043) 39-3333. Attention: 24 hours.